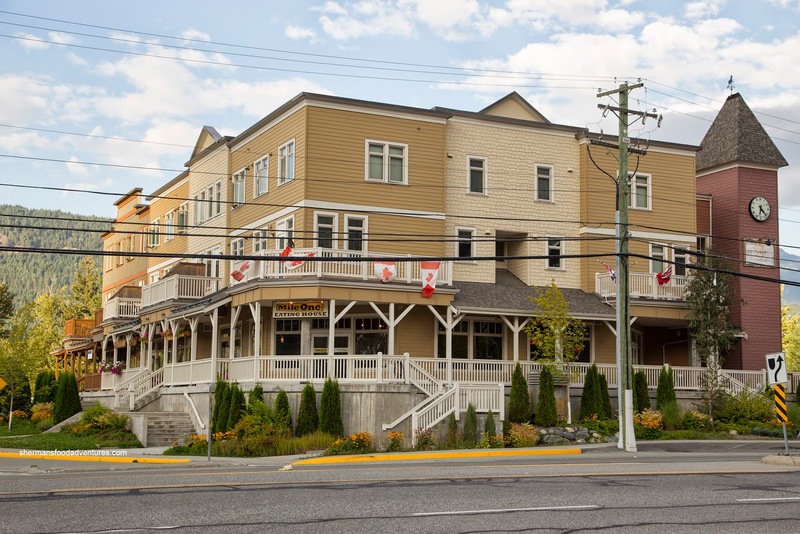 Despite being featured on Food Network's "You Gotta Eat Here", I was not familiar with Mile One Eating House out in Pemberton. It wasn't until my ride up to Araxi's long table dinner that it finally appeared on my radar. Suggested by our awesome driver, it suddenly became priority number one on my visit to Whistler the week after. Besides, with 5 kiddies in tow, finding a place where the food is both plentiful and reasonably-priced was important. So instead of driving 10 minutes into Whistler Village, we headed North for 20 minutes to sleepy Pemberton. Luckily for us, we had made a reservation because the place was packed for a Sunday night. The lineup to order food was almost out the door, but they did their best to expedite the food. 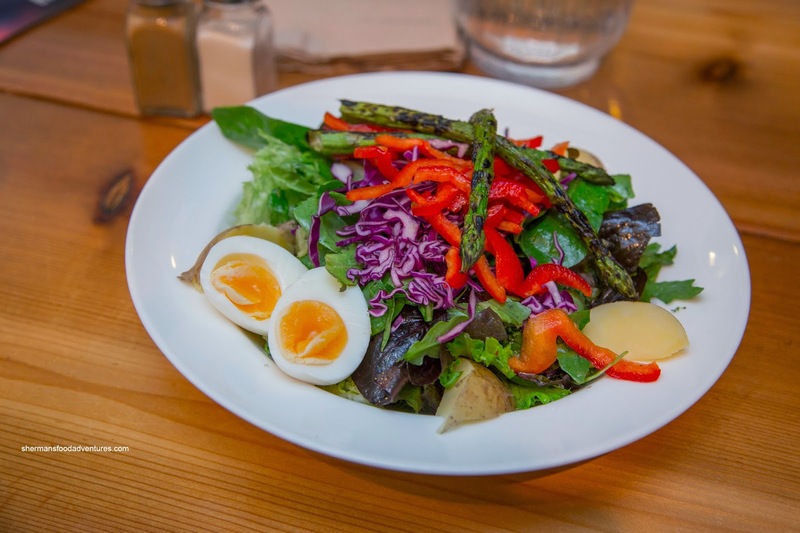 Seeing how my diet over the past few days lacked items in the shade of green, Viv and I started with the Mile One Greens with mesclun greens, grilled asparagus, Pemby blue potato, boiled egg, red bell peppers, purple cabbage, Okanagan white wine & honey vinaigrette. This was a large salad that ate like a Salade Nicoise without the tuna (but could be added for $6.00). All the greens were fresh and crisp, potatoes were fully cooked, but not mushy while the eggs were just barely done. I found the dressing to be light, yet effective at the same time with a definite white wine taste where it was balanced off by the honey. 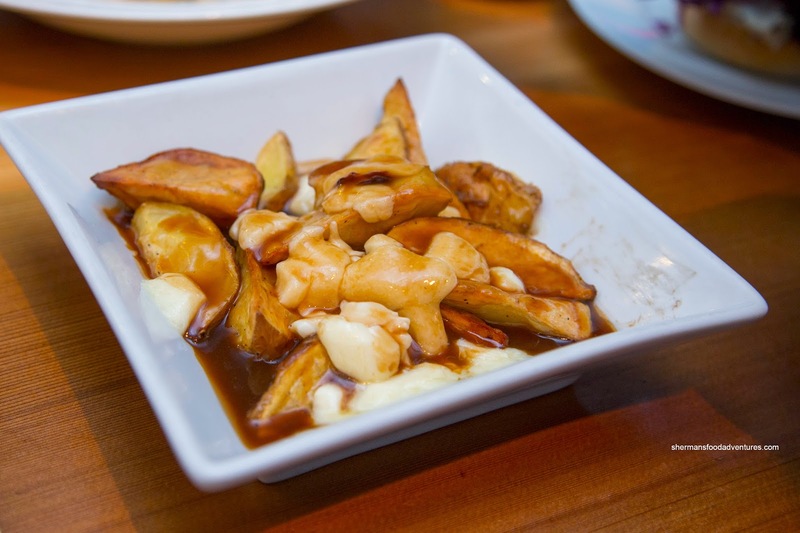 Viv had a side of Farmstead Poutine which featured roasted potato wedges, Okanagan cheese curds and gravy. Being fairly thick and firm, the roasted wedges were not affected by the copious amount of gravy where they retained their firmness. The gravy was starch-thickened and silky with a salty kick. I loved the cheese curds as they were squeaky. 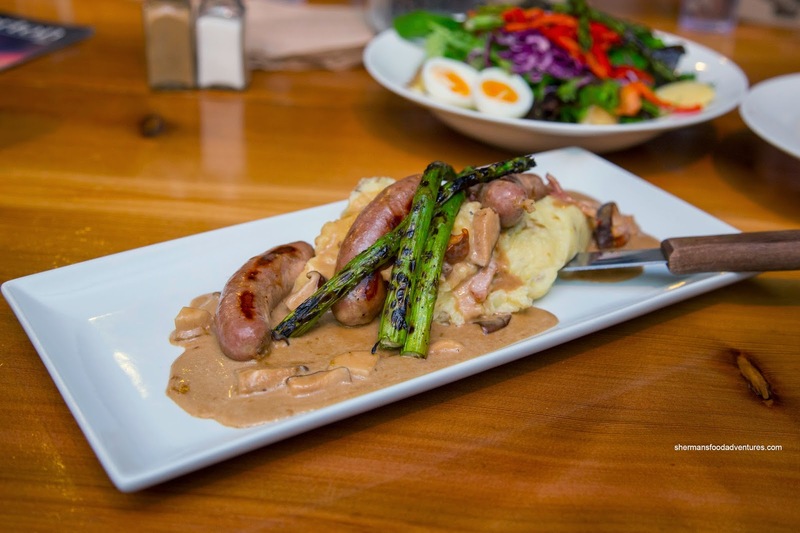 For my main, I went for the Okanagan Apple Bangers & Yukon Gold Mash served with BC mushrooms and smoked Fraser Valley bacon and Nelson Brewing Oatmeal Stout gravy. Again, the portion size was substantial with a large mound of rustically mashed potatoes (with chunks and skin). They were doused with a thick and creamy gravy that had a definite stout hit which was cooked down so it wasn't bitter. The good amount of mushrooms added more depth with a woodsy essence while the ample bacon provided a smoky saltiness. As for the bangers, they were meaty and sweet with a natural pork flavour. These were firm with a nice snap casing. 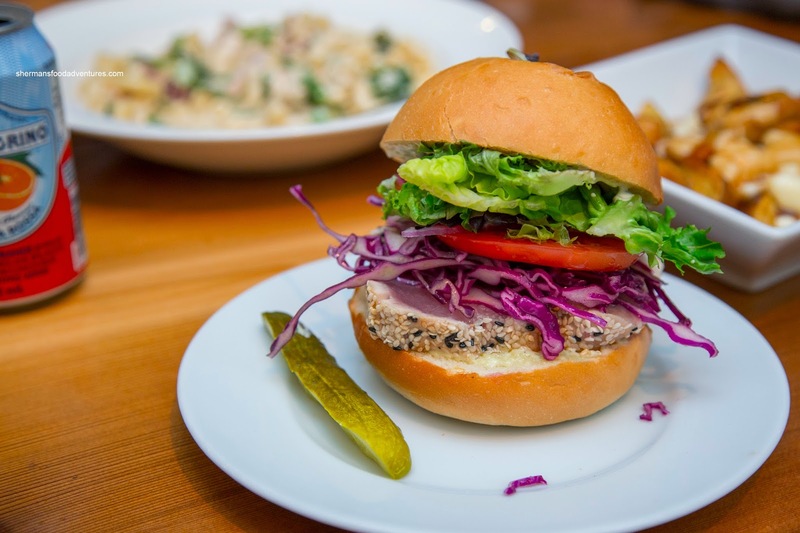 Viv decided to go for something lighter in the Tuna Burger with sesame crusted & seared rare Pacific Albacore Tuna, purple cabbage slaw, wasabi mayo, lettuce, tomato and red onion. Beautifully seared ever-so-slightly with a nutty sesame crust, the tuna was plentiful and soft in texture. I liked the red onion as it added crunch and a sharpness while the slaw upped the crunch and provided acidity. 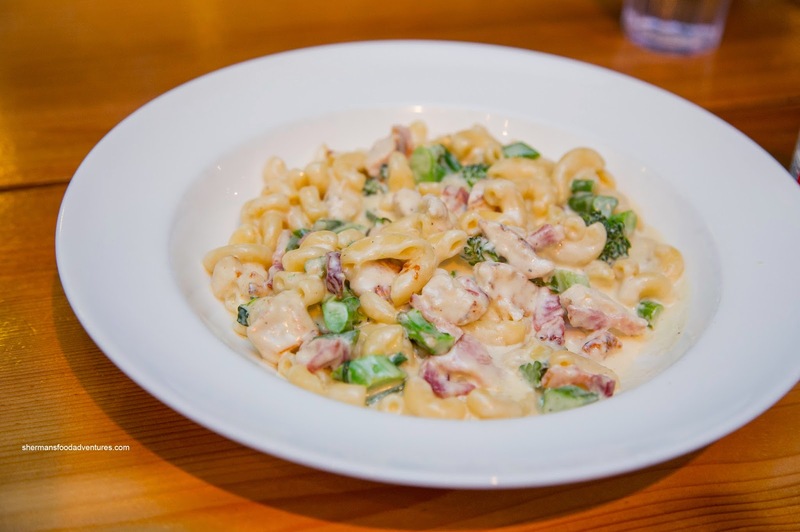 The kiddies shared the Southern Comfort Mac n' Cheese with grilled Fraser Valley chicken, smoked bacon and broccolini. Continuing the theme of large portions, the mac n' cheese was no exception. It was full of somewhat soft macaroni, chunks of firm grilled chicken breast and crunchy bites of broccolini. I found the flavours to be pretty balanced with a slight sharpness from the aged white cheddar. The addition of mozzarella helped bring the whole dish together where there was just enough moisture clinging onto each macaroni. 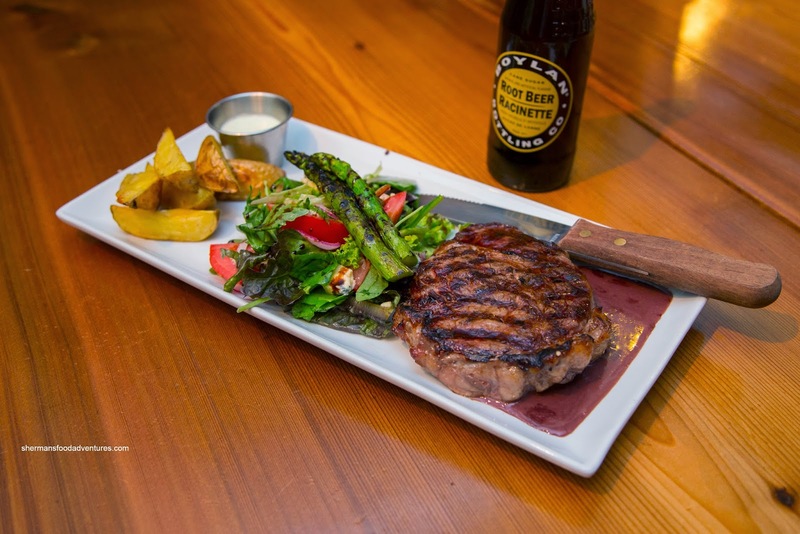 Chill went for the 10 oz Grilled Rib Eye Steak consisting of Canadian Heritage Angus Beef, vine-ripened tomato & Salt Spring Island Beddis blue cheese salad, Yukon Gold potato wedges, grilled asparagus and Okanagan red wine glaze, This was done a nice medium-rare where the steak was flavourful on its own (and as tender as rib eye can get). I particularly liked the red wine glaze as it was more like a demi with a rich wine flavour that was properly cooked down. 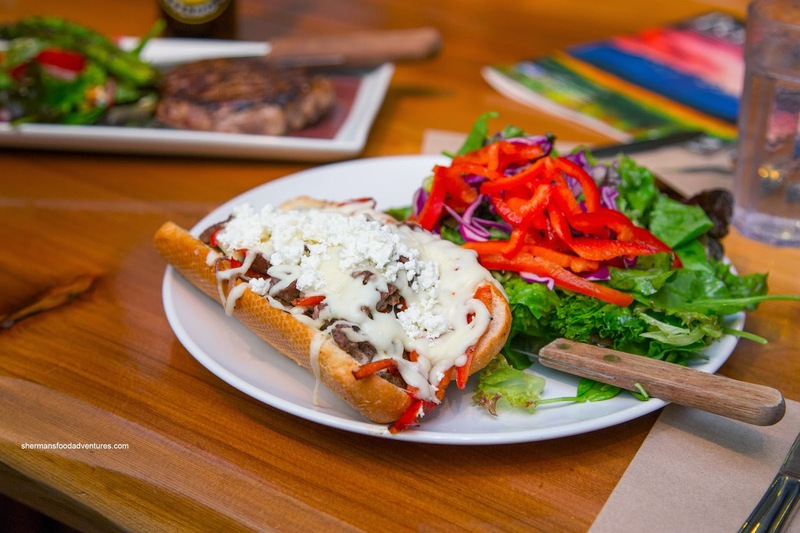 Bubbly opted for the Cheese Steak with Heritage Angus Beef, red bell peppers, mozza, Blue Buck Beer braised onions, horseradish mayo in a hoagie bun. She added some goat cheese to amped up the flavours even more so. The firm while not overly dense bun held up well to the ingredients that featured surprisingly succulent slices of not overly thin beef. It was nicely spiced where the onions added a tangy sweetness. I didn't notice the horseradish mayo too much as it was rather mild. As you can see in the picture, there was plenty of cheese. Her kiddies both had the Pemby Meadows Cheeseburger with aged cheddar and a side of wedges. The buns from Blackbird Bakery (across the street) were firm, but sufficiently airy so they weren't too hard. The thick beef patty was not exactly juicy, but it wasn't overly dry either. It was naturally-flavoured and sported a smoky char on the outside. With the use of aged cheddar, there was enough sharpness to make an impact. 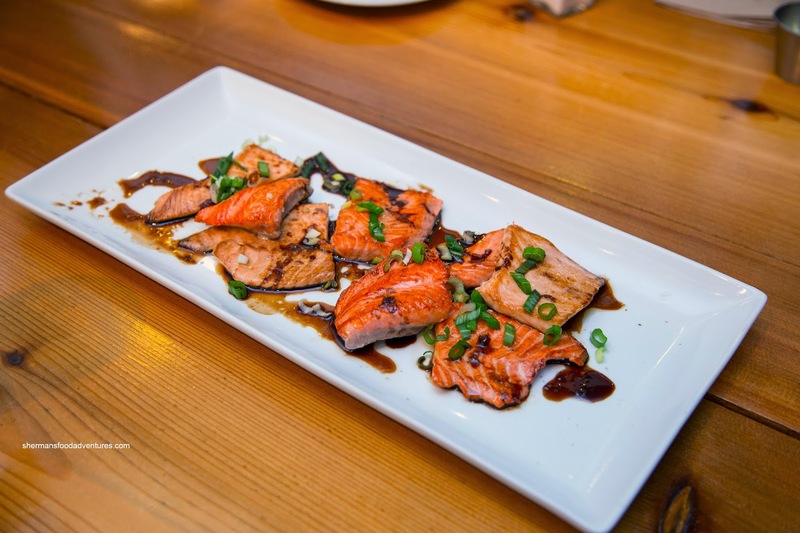 Seeing how we waited awhile to order and for our food, they presented us with a platter of Grilled Salmon drizzled with a sweet soy glaze. It was literally perfectly prepared as it was fully cooked while still moist and fatty. The sweet flesh was accented by the sweet soy, but we had to be conservative with it as it was salty. 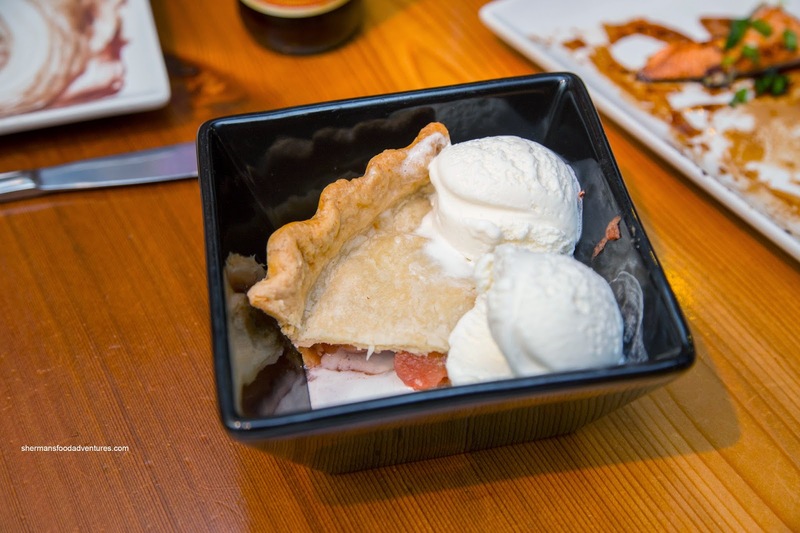 Bubbly couldn't resist having dessert so she went for the Apple Rhubarb Pie with 2 scoops of vanilla ice cream. This was served hot with a flaky and buttery firm crust with a tart and sweet filling. This was a nice way to end a good meal at Mile One Eating House. 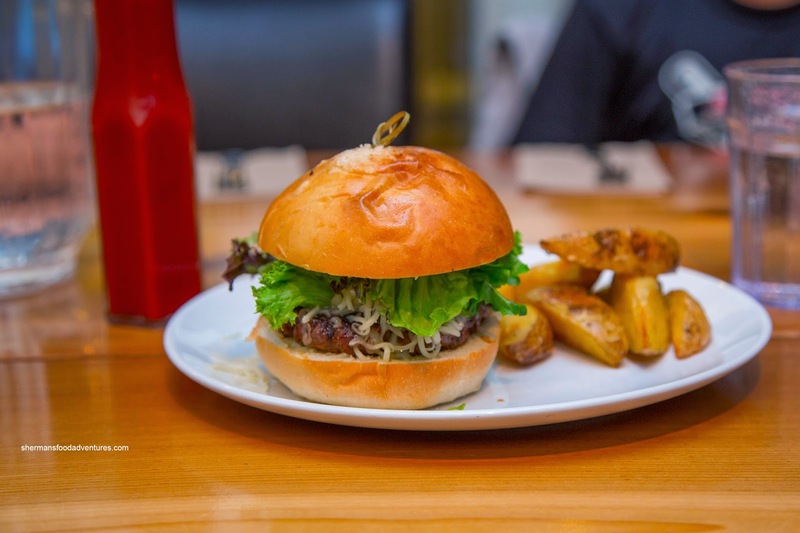 Considering that most places in Whistler don't offer up good value nor interesting eats, I think people should consider driving up to Pemberton to give this place a try.